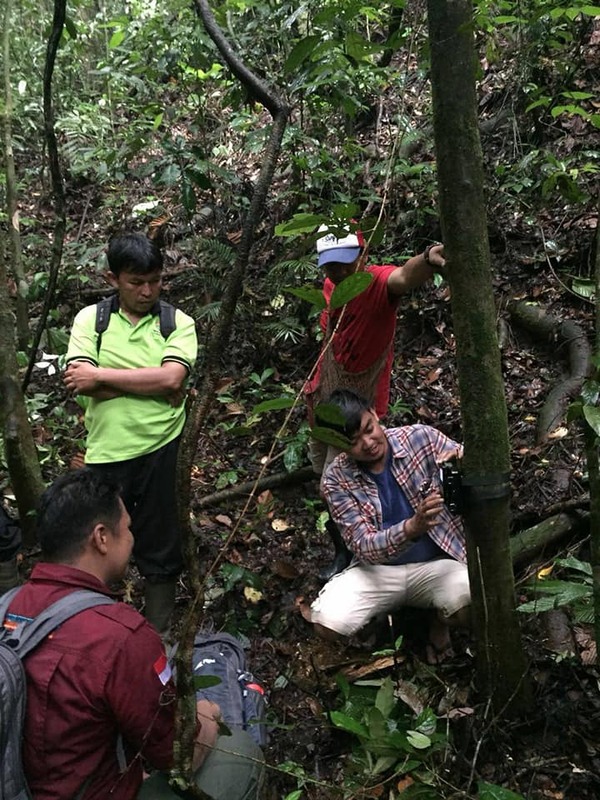 The Sumatra Camera Trap Project is a pilot camera trapping project initially within Isau Isau Nature Reserve, South Sumatra. The project is running with the express permission of the Nature and Biodiversity Agency of South Sumatra. The hope we have is that the project will highlight the inhabitants of the nature reserve and raise the profile of Isau Isau Nature Reserve both locally and globally. We have been given six fauna target species, the Sumatran tiger ( Panthera tigris Sumatrae), Malayan tapir ( Tapirus indicus), Sun bear ( Helarctos malayanus), Sumatran serow ( Capricornis sumatraensis), Sunda Clouded Leopard ( Neofelis diardii) and Northern Dhole (Cuon alpinus). 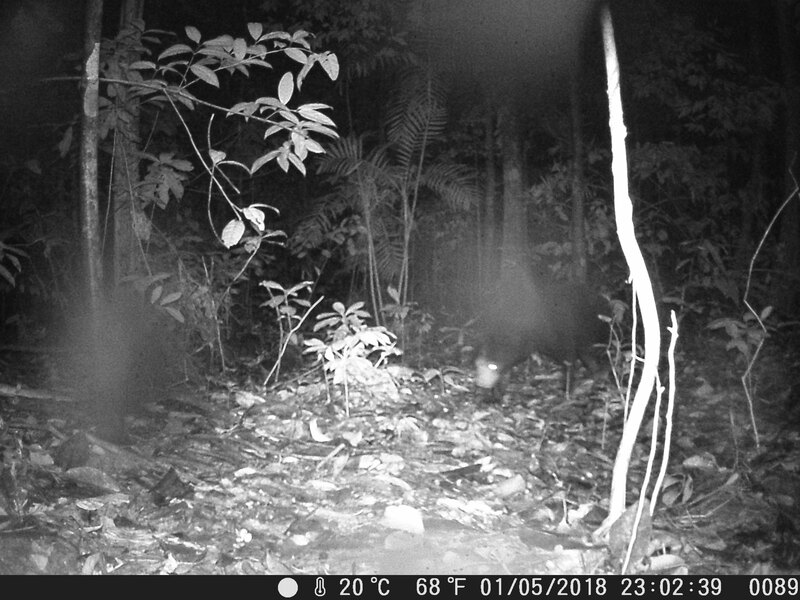 As well as already capturing the first images of sun bears in over a decade, we have also identified new populations of animals that have never been recorded inside Isau Isau Nature Reserve, such as Mitered Leaf Monkey (Presbytis melalaphos) and Binturong (Arctictis binturong). Since there is no current record for what resides with Isau Isau Nature Reserve, we are relying on evidence from over thirty years ago and also the anecdotal evidence of the local populus. Currently, our project is entirely privately funded. This means that we must be mindful of resource use, as well as the speed in which we can expand. During some of our deployments, we have found evidence of human activity in an area that is restricted. We have to approach this subject in a sensitive manner with the local people as we would much rather maintain our good relationship with the local people, as they are proving to be a valuable asset, in terms of providing fruitful locations and aid during the deployment. We have had to almost abandon one of our study sites due to recent human activity which has impeded our ability to inventory species with these areas and to monitor animal numbers. Raising awareness globally is important to us for a number of reasons, so we are very active with our online presence. We are also looking for collaborations or "shout outs" from established organisations to increase our exposure. We are also trying to raise aware of what is residing inside Isau Isau Nature Reserve with the locals. This had lead to increase interest from the local population, especially with the field team. More people are requesting to go on the treks into the jungle to deploy the camera traps. 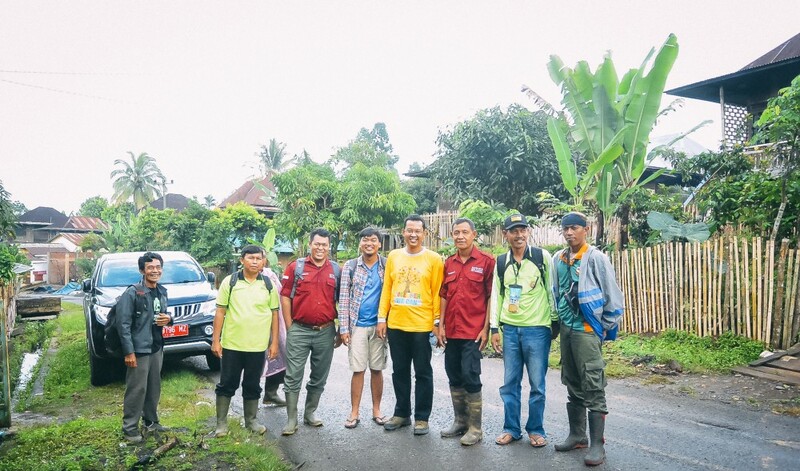 It is vital to keep the local villagers happy for the success of the project so occasionally villagers will go on the treks to see the undetaking and the field team will show them how the cameras work. Being successful in our project is understanding how everything is intertwined and then it is about creating a balancing act in what can sometimes be quite a delicate situation. So far the project has taken the first pictures of Malayan sun bears with Isau Isau Nature Reserve. We currently believe that this population has never been recorded so it is of huge importance. Once our initial study is complete, we may undertake a targeted study of the sun bear population within Isau Isau. 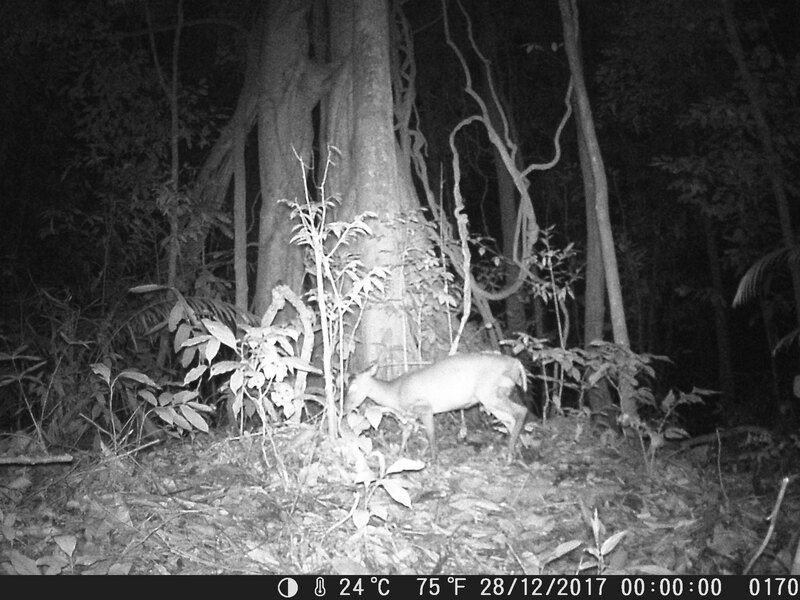 We have also captured evidence of some protected species such as Sambar deer (Rusa unicolor equina) and a possible Asiatic golden cat (Neofelis temminckii). As well as our animal images, we have also captured evidence of an illegal group of poachers. One of our collaborators was able to successfully identify these individuals which lead to a mediation with the group. This culminated in the signing of an agreement that if these men are found to be entering the forest for illegal activity that the police will then become involved and the images will be shown as evidence. In late 2017, I had to give up the job as a zoo keeper at a conservation charity in Kent, England. It was position that I had been working towards for my whole life. After my partner was made redundant upon returning to work from maternity leave, we could not live on the wage of a zoo keeper so we made the difficult decision for her to return to work and for me to stay at home with my son. It was the right decision but it was devestating at the same time and drove me into a depression. This is when I met my colleague and friend Pungky Nanda Pratama. Pungky is a hugely inspirational conservationist working in South Sumatra. He contacted me due to our similar interests. I had partaken in camera trapping projects as part of my previous work place so I was surprised to hear that there were no camera trapping projects happening in and around the area where Pungky lives. I really wanted to still be contributing to conservation so we quickly agreed that we thought we would work well together. I took a part time job when I had child care covered to earn some money to buy a camera trap. The first camera arrived in mid-March and was deployed and since then we have grown the project with captures of species such as wild pig, sambar, asiatic golden cat and also what we believe to be an unrecorded population of sun bears. We have also captured images of a group of poachers. After a successful identification from one of our collaborators, we were able to initiate a successful mitigation with the poaching group. An article about our sun bear captures from WildArk.